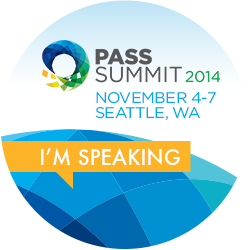 Home » Professional Development » PASS Summit 2014 – I’m speaking! PASS Summit 2014 – I’m speaking! In the next 3 years, I want to present at the PASS Summit. Today I am thrilled and honored to say that this November I will achieve that goal (got it in just under the wire)! Drawing thousands of attendees from across the globe, the PASS Summit is the largest Microsoft SQL Server conference in the world. It’s the Super Bowl, if you will, for SQL Server professionals. This year 943 sessions were submitted by 335 different speakers. I am so proud that my session was selected to fill one of only 144 community slots. And really, I’m excited just to be going. I attended my one and only PASS Summit several years ago (to be honest I’m not even sure what year it was). I wasn’t involved in the SQL community at the time, didn’t attend my local user group, etc. And I made a typical Summit rookie mistake: I went back to my hotel at 5pm every day. A big part of attending an event like the Summit is the networking. Think about it. How often do you have the opportunity to talk with that many other professionals who actually get what you do? I will not be making the same mistake twice. I’m already getting ready for SQLKaraoke. Thanks to PASS for this opportunity and a huge thank you to the volunteers who give up their time to make this and other PASS events happen. Congratulations to all the speakers! Congrats, Colleen! Give em hell! I got my rejection this morning, with a reason of “similar topic” or words to that effect), so I’m really glad to see someone actually presenting on the topic. Congratulations Colleen – very proud of you !! And you are putting on a great session. Thanks for all the great info!